Handcrafted guitars from Vox's G-Rok custom shop. Musikmesse 2011 PRESS RELEASE: Starting in April of 2011, VOX Guitars' G-Rok R&D facility in Novato, California, USA, will begin offering exquisitely handcrafted electric guitars on a limited production basis. 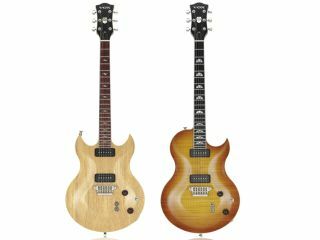 Established in 2007 to focus on development of a new generation of VOX electric guitars, G-Rok R&D created the current award-winning lineup of solid and semi-hollow instruments; driven by innovation in design, ergonomics, pickups and hardware. Staffed by VP of Development Rich Lasner, Designer Eric Kirkland and Engineer/Luthier Bob McDonald, G-Rok will now offer players the experience of owning a very personal guitar, meticulously constructed by hand in the USA. Unique among larger-scale Custom Shop undertakings of big US guitar makers, VOX USA Custom guitars will be made one at a time, using a single luthier from start to finish, with the customer receiving a true handcrafted instrument. Four contemporary VOX body styles are available, along with a wide variety of neck, body and fingerboard woods, inlay choices, and finishes allowing the customer to create their ultimate guitar. Proprietary VOX hardware and a choice of VOX CoAxe or DiMarzio Three-90 pickups complete the package. "We offer players the experience of getting a very personal guitar meticulously constructed by hand," Lasner states. "The build quality is second to none while materials are hand selected from the highest quality tone woods." With less than 60 instruments slated for 2011, these beautiful instruments will be in very restricted supply. Initially available only within the USA, the VOX USA Custom Guitars will be progressively available internationally throughout 2011.